Sale price is reflected. Regular Price $8.99. Featuring premium paper stock planning pages and linen embossed cover, you can plan up to 13 months ahead and enjoy full-color artwork of Terry Redlin's depictions of small town America! 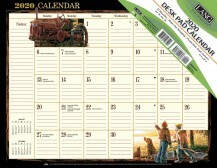 Terry Redlin 2-Year Planner is conveniently sized for your pocket or purse so you can use it at your desk or on the go. 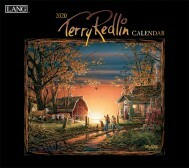 Plan your schedule right on your desk with the Terry Redlin Desk Pad Calendar! The Terry Redlin Monthly Planner features Terry Redlin's artwork of rural settings in a 13-month calendar format with ample room for notes and engagements. Update your schedule on the go with the Terry Redlin Monthly Pocket Planner! Stay organized with the Terry Redlin Spiral Engagement Planner! 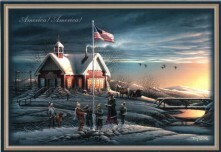 Decorate your home or office with the Terry Redlin Vertical Wall Calendar and each month's artwork will transport you to inviting locales from small town America. Wells St. by LANG Wall Calendars feature monthly full color images based on hand-painted originals, elegant linen embossed paper stock, and a brass grommet for hanging. 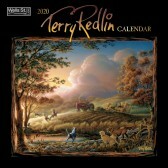 The Terry Redlin WSBL Wall Calendar features monthly artwork by Terry Redlin of vivid outdoor settings.